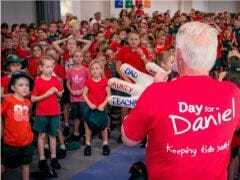 Join us in celebrating our 5th Annual Dance for Daniel in Townsville. This sensational night will be held at The Ville in Sir Leslie Thiess Drive. Treat yourself to a 3 course meal with beer and wine and great entertainment. Auctions and Raffles will also be available. Table of 10 - $1500. Individual Tickets - $150 each. Limited tickets left, call 0404 228 819 to book!